Some companies do Manila > El Nido, but it can be pricey. 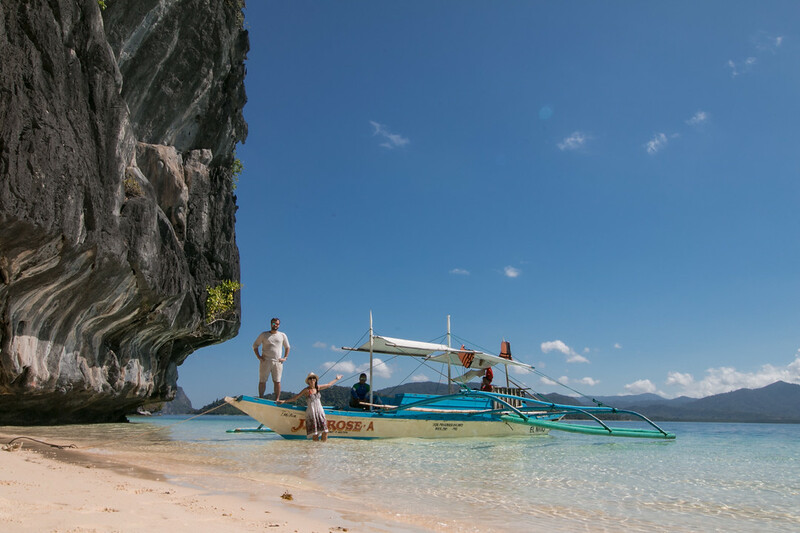 Alternatively you can fly to Puerto Princesa and take a van to El Nido. There is no flight going from Coron to El Nido. Plenty of van companies going from Puerto Princesa to El Nido. We got one for 400PHP/person, probably the best price you can get, but not the best service. Although we were in El Nido in exactly 5 hours. Most well known companies do 600PHP/person. Negociable to 500. Best thing to do is to show up directly at San José Bus Terminal in Puerto Princesa, pretty easy and straightforward. In El Nido, the bus station is at Corong Corong, as the vans are not allowed to go in the centre. There is a fast boat and a banca coming from Coron every day. Fast boat is 1,760 PHP/person and takes around 4 hours. Banca is 1,200PHP/person and takes between 7 to 10 hours, depending on the weather. (+20PHP/person terminal fee). There is also a boat going from Manila to El Nido, via Coron. Tricycles or “trikes” are the way to go. El Nido town to Corong Corong beach is a fixed price of 50PHP. El Nido town to Las Cabanas will be 150PHP. More than that, just rent a motorbike it will be cheaper and a better way for you to visit the area. It is easy to rent a motorbike in El Nido Town, there are tons of places you will find one. Prices should be around 300PHP for half a day to 500PHP for the entire day. 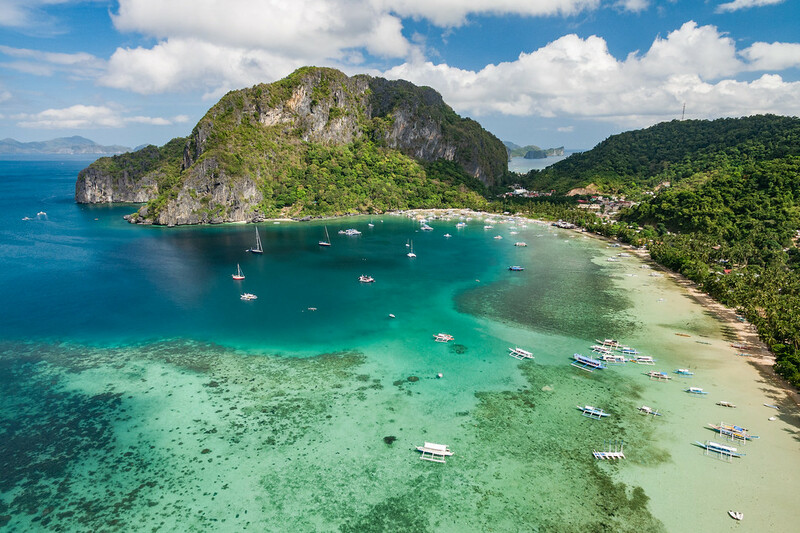 Amongst the 7,107 islands that compose the Philippines, more than 1,000 are around El Nido. Most people come here to do Island Hopping and here is why : the islands and beaches are INSANE there. 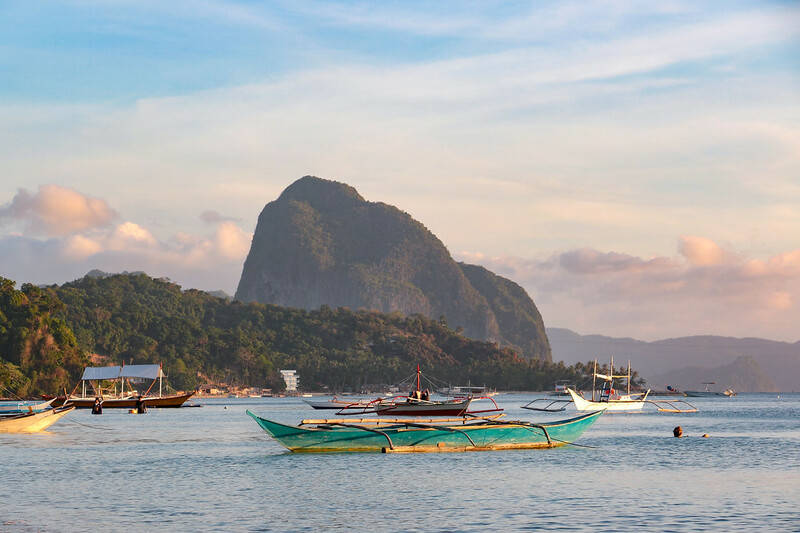 Here are the different Island Hopping tours you can do around El Nido. All tours include lunch, water, guide, mask & snorkel. You have to add the 200 PHP eco tourism development fee good for 10 days. Lunch consists usually of rice, fish, squid, pork or chicken, bananas / mangoes. Kayaks are available for rent at the Small & Big Lagoon for 200PHP. We did a combination of A & B with a private boat. Privates boats will usually cost you 5,000 so it will be worth it if you’re 3 or 4 sharing. Why book a private boat tour ? If you are at least a group of 3 or 4, it will be worth it ! You can also organise a camping trip on one of the islands around El Nido, as a 2D1N Glamping Island tour. We haven’t tried it but it looks like an amazing experience ! Rent a motorbike and go explore E Nido area, there are plenty of other places to see. *All 3 of these places are perfect for sunset ! Chislyk Cottages : Clean bungalows with private bathroom, 1 double and 1 single bed, a terrace and a million dollar view on the beach. We got one for 1,200/night. Compared to other places at the same price it was the best. Tay Miloy : double room with shared bathroom for 500/night. We didn’t stay there as the room looked too dirty for me, but it might not be for you ?! Ailyn Beach Resort : they have double rooms for around 1,000. To be honest they are not clean enough and need some renovation (and we’re not even fussy), but Ailyn and her staff were so genuinely nice, we had to mention them. Novie’s Tourist Inn : on the road side but clean and affordable. Not located on the right spot on Maps, it’s actually right opposite Greenviews Resort. Greenviews Resort : prices lean towards the 1,500 but you get a nice & clean room. Where to eat in El Nido ? 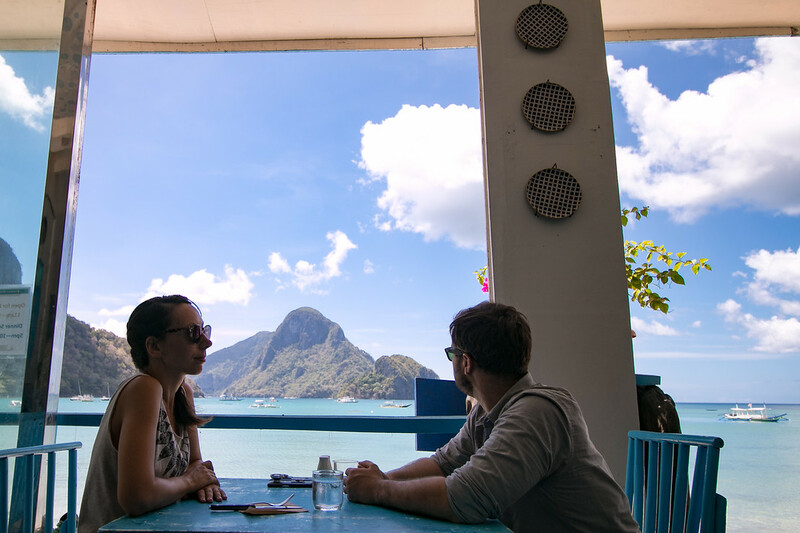 Eating in El Nido was the most expensive we’ve seen in the Philippines. That is if you eat on the main road, next to the beach in El Nido Town. If you go further away, outside of town you will find plenty of cheap food vendors. These are the ones we went to and can recommend. Creperie “Jhodec” : I forgot the actual name of this place but it was in Serena St, it’s a crêperie bretonne with the triskel sign painted on a wall. They have a sitting area upstairs, delicious crepes (the best we had outside of France) and good wifi. Artcafe : lots of tables, medium range prices and good wifi. There IS an ATM in El Nido Town, right next to the pier. That being said, there is only one and you won’t be able to pay by card anywhere so it might be wise to come with cash. El Nido doesn’t have 24-hours electricity so you will experience power cuts. El Nido has the worst Internet connection we’ve ever experienced. Even the 4g was hard to get, but it was better in El Nido Town than Corong Corong Beach. Bring a dry bag for your gear on your island hopping trip. It is expensive and touristy BUT there is a reason why : the islands and beaches are stunning, do not miss it ! PALAWAN is the first episode of Expedition 100, The Vlog Expedition's new NextGen vlog series where Violette & Antoine are taking you on an ultimate world tour seeking their top 100 most extraordinary places on Earth. Don't forget the EXPLORE menu at the end of the vlog, where you can find Violette's pictures, 360 videos, practical blog posts for you to organize a similar trip and lots of other stuff ! Learn more : how to use NextGen vlogs. The player isn’t displaying properly ? Watch it here.